2012 Vectrix VX-3. Picture credits - Vectrix. Submit more pictures. The VX-3 is the ideal blend of performance and stability for daily commutes and trips around town. The revolutionary three-wheeled all-electric, all-highway Personal Electric Vehicle is capable of speeds up to 68 mph with a range of up to 50-80 miles. Carrying capacity: Under-seat storage. Optional top case. Comments: Range 50-80 miles (80-128 km) per charge depending on speed. Appox 2 hour charging time. LiFePO4 128V battery. Patented Multi-Function Throttle provides regenerative braking and slow-speed reverse. Ask questions Join the 12 Vectrix VX-3 discussion group or the general Vectrix discussion group. 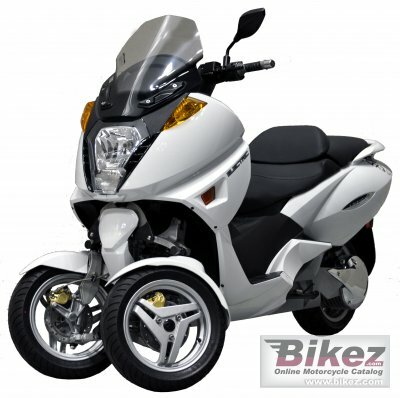 Click here to sell a used 2012 Vectrix VX-3 or advertise any other MC for sale. You can list all available Vectrix VX-3 bikes and also sign up for e-mail notification when such motorcycles are advertised in the future. Ads with or without pictures are easy to create. Our classifieds are completely free with sections for every country in the world. You can also check out our list of related motorbikes. Compare technical data. Look at photos. View your fellow riders' rating of the bike's reliability, design, engine performance, accident risk, repair cost, etc.